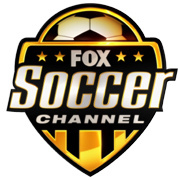 Fox Soccer Channel (FSC) will air MLS matches on Saturday nights starting next season. The big news is that these matches will include a live pre and post game show, giving the league their first ever on-site, three-hour live show. The pre and post game shows will include analysis of the games, the players and involve fans in the action. FSC will air 28 weekly games during the season and at least three during the playoffs. Just getting the games on the air is good, but the additional pre and post game shows will open up the league to even more people. It will explain the game for those who might not live and breath soccer. Hopefully it will also lead to some better production value across the board. The league will now of games of the week on Thursday (ESPN2) and Saturday (FSC). Hopefully having these games at standardized times will make it easier for casual fans to follow the game. If you know every Thursday at 7pm there is a match, then you don't have to go hunting to find it. MLS has made a lot of big moves in the last six months that will bring in a large amount of cash and exposure. The question now becomes can the quality of play on the field reach the level needed to sustain and grow the league? The youth academies and reserve leagues are an indication that they are heading in that direction, but there is still the issue of forced parity. Anyways, it is nice to know that I'll have 28-weeks of doing very little on my Saturday nights other then watching soccer matches. As if my social life needed another knock against it.